Hot Deal | Zeiss Distagon 25mm f/2 ZE Lens for Canon EF Mount Cameras $1699 | Free Shipping @ B&H Photo Video thru 1/31 for $1699. Expires . The Distagon 25mm f/2 ZE Lens for Canon EF Mount Cameras from Zeiss is a high-speed wide angle lens that is an excellent choice when you need to shoot in close quarters and don't want any distortion. This lens contains dual aspheric surfaces that practically eliminate any chance of either field curvature or chromatic aberration. With a wide angle lens, you can't ask for more than that. The lens is rich in Zeiss' renowned tradition of producing ultra high-quality optics that are sharp whether used at maximum or minimum aperture. Their floating element design produces a lens that delivers contrasty edges at no matter what distance you shoot at. It works extremely well especially when hand-held under marginal lighting scenarios. It also features a short focus rotation that makes it an excellent choice for rapid shooting situations. 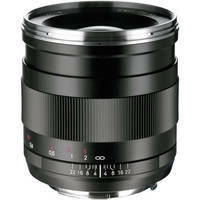 The lens is designed for use with full-frame SLR and DSLR cameras. Combined with a DSLR with a 1.5 crop factor, the lens has an effective focal length of 37.5mm. Spam Protection: * Answer of 6 + 8?